This entry was posted on Tuesday, December 1st, 2009 at 12:25 pm	and is filed under Recipes. You can follow any responses to this entry through the RSS 2.0 feed. You can leave a response, or trackback from your own site. What’s your favorite cake, by the way? Thanks for sharing this, I tried it out the other day and it turned out great! Would you be able to send more pictures? Sadly, there are no other photos. I’ve been looking at other sites, and although this is another not-ideal photo, it’s the closest to what the real thing looks like. I will surely take and post more photos the next time I bake this cake. Beautiful looking texture, can’t wait to try it out this weekend. Would you be able to send more pictures? I have to say that this story was awesome. My husband and I are making this together for my birthday tomorrow as we both remember it from our childhoods as the best cake ever! Thank you for the chuckle we both had as I read it to him! Hi. Thanks for the recipe. 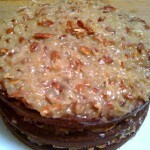 My grandmother used to make German Chocolate cake for Christmas when I was a little girl and I loved it. So I asked my aunt for the recipe and I thought that it was something that she got from our great grandmother but the funny thing is that she used the recipe off the back of the Baker’s German Chocolate Baking square! All of this time, I was searching for the recipe on the web and it was right in the baking aisle the whole time. Wow. I also enjoyed your story and who knew that recipe would become so popular? I hadn’t made one of these in 20 years and bought the German’s Sweet Chocolate expecting the recipe on the package – and it wasn’t there! So I went on-line and they now have two different recipes. This one helped me decide which to do. I’m making it for book club and I knew German Chocolate Cake wasn’t really Germany, but not the full story, so thanks for the story about the cake!